Chatbots have become a significant part of today’s digital marketing strategies for numerous companies like H&M and Disney. 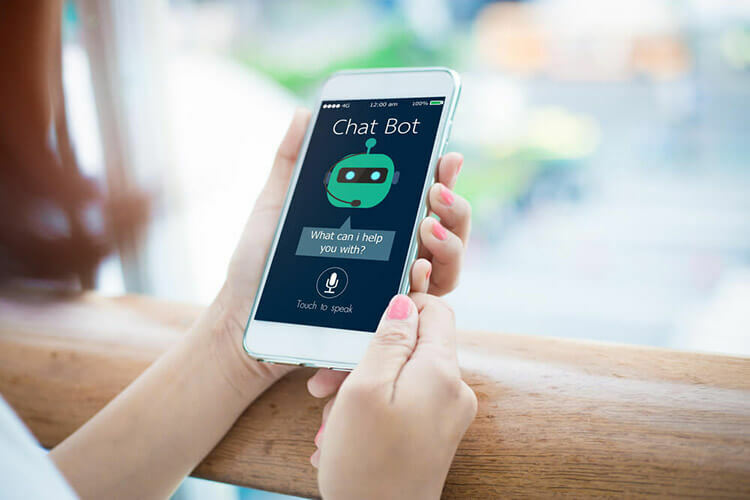 While the use of chatbots for communication with customers and sales generation cannot surprise anyone, how can enterprise chatbots become in handy for businesses? According to a report published by Juniper Research, chatbots can cut global operational costs by $8 billion in total by 2020. The main chatbot characteristic worth paying attention to is the capability to automate corporate tasks with voice or text commands. Numerous tasks from deciding where to go for lunch to retrieving data from a corporate database can be performed by chatbots. The most valuable benefit of chatbots is that they enable employees to accomplish many routine tasks in a few lines of ordinary text. Powered by NLP, chatbots can understand a human text and can replace real personal assistants while understanding commands typical for our everyday life. Let’s look at other benefits enterprise chatbots bring to the business. Virtual assistants integrated into corporate software can significantly increase employee productivity by enabling them to focus on key tasks instead of wasting their effort on secondary routine issues. Enterprise work processes rely on multiple internal systems that handle business operations. Constant switching between these systems, scheduling endless meetings, organizing people takes time. Enterprise chatbots can increase your productivity by automating routine activities. Virtual assistants also can provide companies with a high level of business intelligence. It means that, with enterprise chatbots, you can get an effective instrument that allows you to timely determine which businesses processes need improvement and which ones show greater results and why. Virtual assistants powered by artificial intelligence (AI) can provide you with an advanced data analysis through integration with your existing enterprise solutions such as customer relationship management (CRM) systems. With machine learning capabilities, chatbots can be empowered to predict what data you will need soon. Thus, virtual assistants can be one-step ahead and able to provide you with the necessary information even without the need for receiving a corresponding command. The benefit to access data from your corporate solutions without the need for switching between them becomes even more useful in the mobile context. 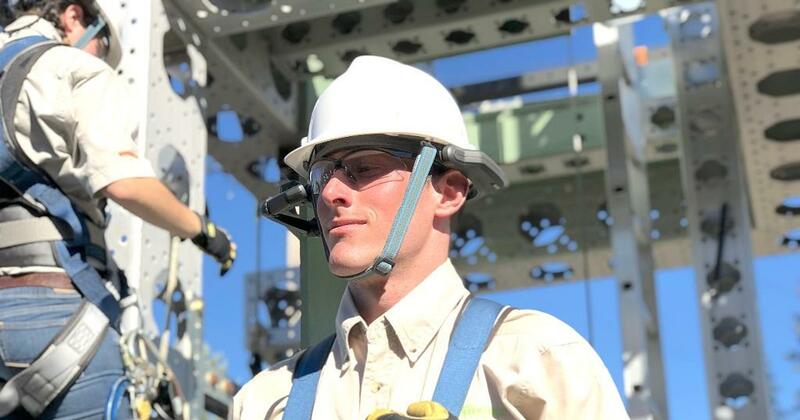 Since many employees use their mobile devices for work purposes, an ability to keep working out of the workplace is crucial for today’s business processes. 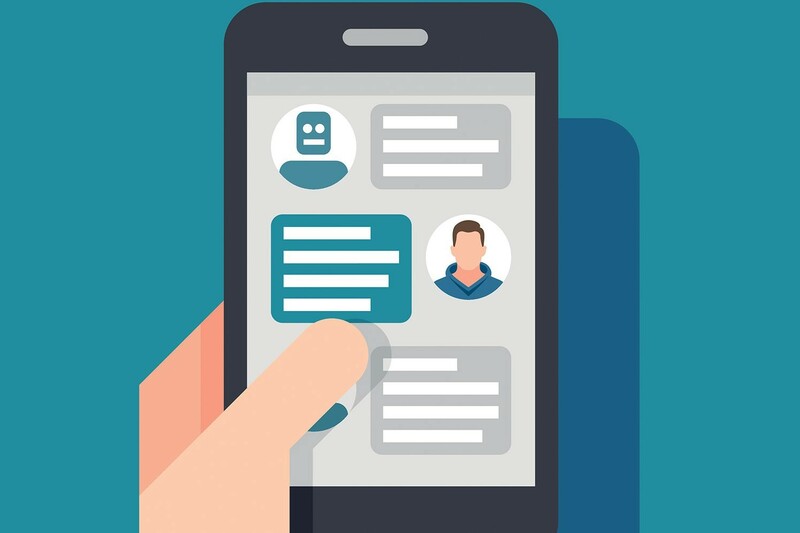 With their ability to properly function on mobile devices, chatbots provide employees with an important capability to have access to corporate data at any time and any location. Furthermore, it makes the data exchange ever more efficient by eliminating the need for switching between multiple corporate mobile apps. Chatbots are widely known as a marketing instrument. 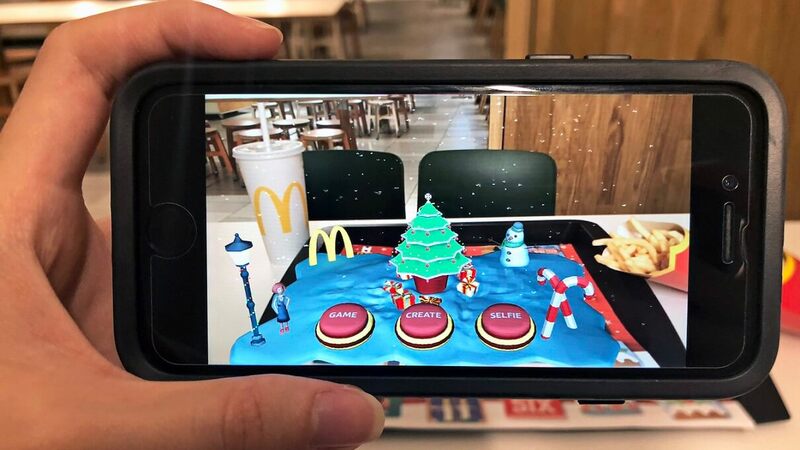 Numerous companies use them to provide their customers with qualified support and let them make purchases in a more entertaining, faster, and less invasive manner. However, as enterprise solutions, chatbots are only gaining momentum. 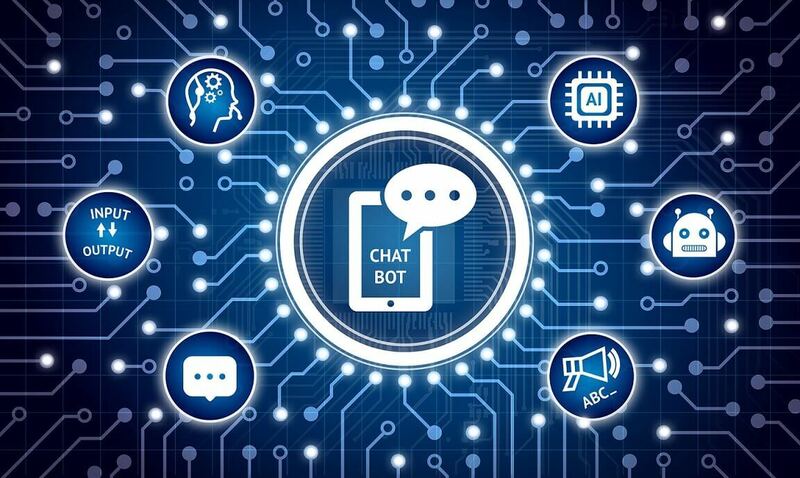 They take their start from the period when team members have begun to use third-party chatbots provided by enterprise messaging apps such as Slack. When benefits of chatbots became evident from the corporate perspective, commercial organizations started developing their own enterprise chatbots. They wanted to create a more efficient interaction with their both B2B customers and employees, as well as improve enterprise business processes. Chatbot integrations can help employees maintain different business processes such as customer support and generating sales. They integrate with various enterprise solutions, such as customer relationship management (CRM), ticket, and enterprise resource planning (ERP) systems via application programming interfaces (APIs). Even if your corporate solutions are all connected to one CRM system, you still have to switch between multiple tabs, windows, and menus to get the necessary information for a particular case. Although, if you have an enterprise chatbot integrated into all necessary systems and databases, you can only enter a couple of queries to get the requested data almost immediately without having to dig on several tabs. It adds even more value when you need to share requested data with certain team members. For this purpose, you don’t need to copy-paste your data and switch to another solution. Instead, you can instantly share this data right in your corporate chat room. As an option, your corporate chatbot can be your own personal assistant and can answer emails when you’re stuck in a meeting or busy with some other task. In fact, the number of possible applications of enterprise chatbots is endless, and we will cover the main of them below. Companies often need to be able to organize meetings for different departments and particular employees using digital solutions. Having different meeting categories for each department is crucial for being able to monitor easily who’s attending what meeting. 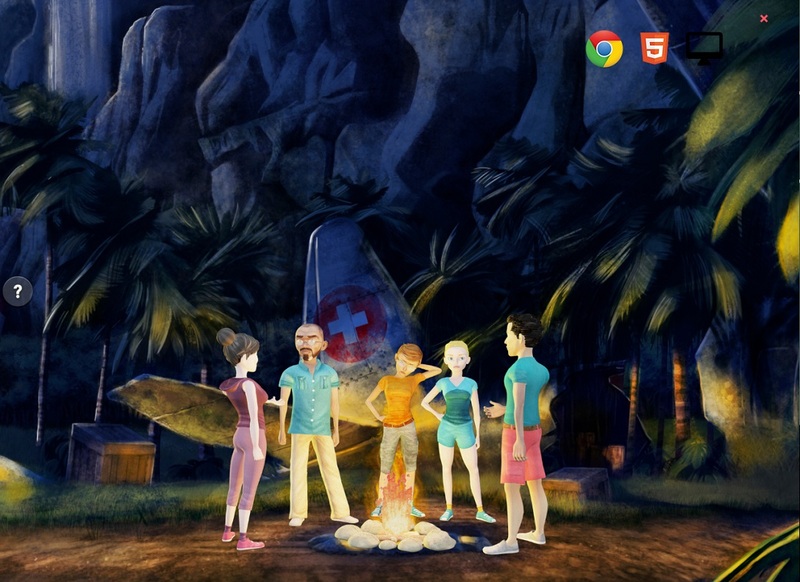 The tasks mentioned above is a responsibility of event management software like Google Calendar or Bizzabo. However, they provide poor capabilities for efficient communication and oblige employees to navigate manually a necessary chat, event, or thread. Chatbots provide a unified and multi-purpose messaging interface where all collaboration can happen within certain events or accounts. With the possibility to communicate with different teams, send video emails to certain employees, and assign meetings in one interface is crucial for efficient business collaboration. Chatbots can add valuable context to team collaboration and eliminate inefficiencies within event management. 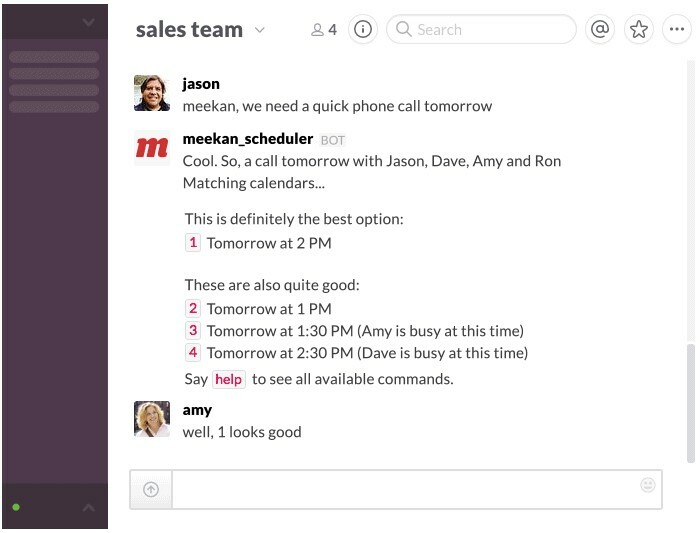 In particular, a Slack-based chatbot called Meekan helps employees match their schedules. Instead of sending emails or manual updating their online calendars, specialists can text the chatbot to schedule a meeting. Once a command is processed, Meekan checks the employees’ schedule to offer and then book a convenient date and time for all team members. If an employee cannot attend the meeting, this chatbot looks for a convenient date until it finds the right time. This ensures that everyone in a team will attend the meeting and eliminates the need to browse manually through Google calendar to identify the right time. According to a survey conducted by Software Advice, 53% of employees say that about 10% of all their projects don’t meet predefined deadlines. Apart from typical reasons for missed deadlines, one of such reasons can lay in project management (PM) system used by a company. Many PM systems are difficult to use especially for new or temporary employees. This can result in missed deadlines since employees can remain not up-to-date on deadlines. It means that project management can be even more complex in the case where a company doesn’t use a system with a user-friendly interface. Thus, chatbots can become a good and cost-effective alternative. PM systems typically offer integrations with different enterprise solutions. 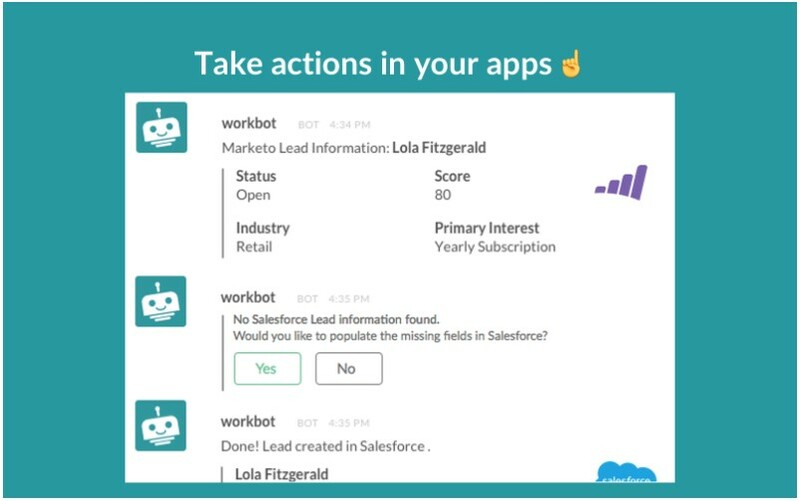 But using chatbots over API based integration, teams can significantly simplify their workflows. Employees at small and medium enterprises are often supposed to maintain multiple tasks. While handling multiple is difficult, things become even worse when this process involves lots of manual work. Project management systems provide wide capabilities for task assignment but they oblige project managers to do this manually. If a particular employee is unavailable for some task, project managers often have to email other related specialists to depute this task. In this case, chatbots can become in handy since they’re effective instruments for automating task assignment. Unlike Excel, Jira, or Trello, virtual assistants can trigger certain commands to assign a task automatically to an available employee. According to a report published by Gartner, (content only available to Gartner clients), within enterprise messaging systems, chatbots are able to automate the workflow and sync calendars to assign a project to the right person. A nice example of task management conducted by a chatbot is an AI-enabled virtual assistant called Howdy. With Howdy, Ladder, an online marketing company, automated its content sharing process. They set up a spreadsheet with links to content to share and hooked it up to the chatbot. As a result, they got a 225% growth in sharing their content by team members. 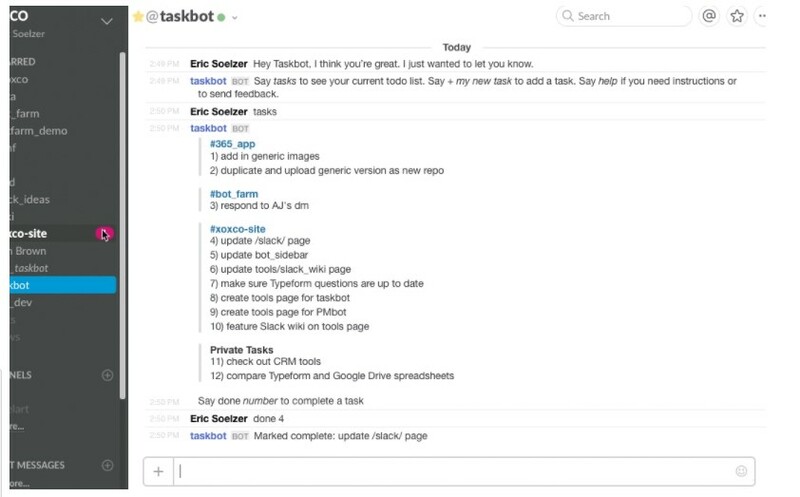 Workbot, another chatbot helps teams automate a wide range of tasks for companies. In particular, it enables employees to use Slack or Jira to integrate automatically with other enterprise solutions and retrieve necessary data. In addition, team members can access all details about all leads and maintain tickets right in Slack. Large organizations have large teams. It means that they maintain many specialists within one company, which requires a lot of resources including time. While it’s hard to automate somehow high priority tasks, HR teams can reduce the time needed for accomplishing low priority ones. For instance, HR team members spend much time finding the necessary information requested by candidates or employees. This information can include holidays, vacations, paychecks, insurance policies, and so on. In fact, this is all frequently requested information that is hard to remember and that takes much time to find and send to numerous recipients. This is exactly the case where a chatbot can help. An enterprise chatbot can provide employees with a capability to ask questions at any time and any place as well as get an immediate answer. For instance, HR Converse, an HR chatbot, handles the recruitment and follow-up tasks. It helps HR teams find the right candidate among hundreds of applicants. HR Converse can be integrated with all available channels including emails and applicant tracking systems. This chatbot is able to communicate with candidates and ask them follow-up questions to determine their skills. Depending on answers received HR converse updates the candidate’s profile within the corporate database. This eliminates the need for numerous and often useless communication with those candidates who aren’t a good match for a particular position. Another area of whether enterprise chatbots can become in use is the typical IT Help Desk. To be cost-effective, various companies tend to outsource Help Desk tasks. However, to be even smarter than that, enterprises should outsource their technical support to their own AI-enabled chatbot. Chatbots can decrease the number of necessary help desk specialists by simplifying the maintaining of frequent and similar requests. With virtual assistants, your employees will get fast assistance in their technical issues without the need for approaching experts in a number of cases. As a result, you can cut your operational costs. For example, IT helpdesk BOT can answer repetitive technical questions while enabling help desk experts to focus on complex requests. This helps companies significantly save their time processing simple queries and improve their overall support efficiency. Using machine learning, IT Helpdesk Bot “memorizes” answers to routine support queries while improving the quality of its assistance. This chatbot can integrate with different solutions like Jira and SharePoint and can help employees solve such frequent and simple problems as password resets, token generation, and device disabling. Many organizations still hesitate to implement enterprise chatbots since the technology remains in its infancy and numerous companies aren’t aware of all benefits provided by AI-enabled virtual assistants. According to Gartner, project management chatbots will have extensive implementation only in the next decade. Regardless of the slow implementation of enterprise chatbots across various industries, early adopters have already managed to recognize the valuable benefits of this technology. Chatbots are incredibly essential instruments that are able to increase efficiency for small and medium enterprises significantly. Virtual assistants are cost-effective tools that greatly simplify and optimize the workflow process.